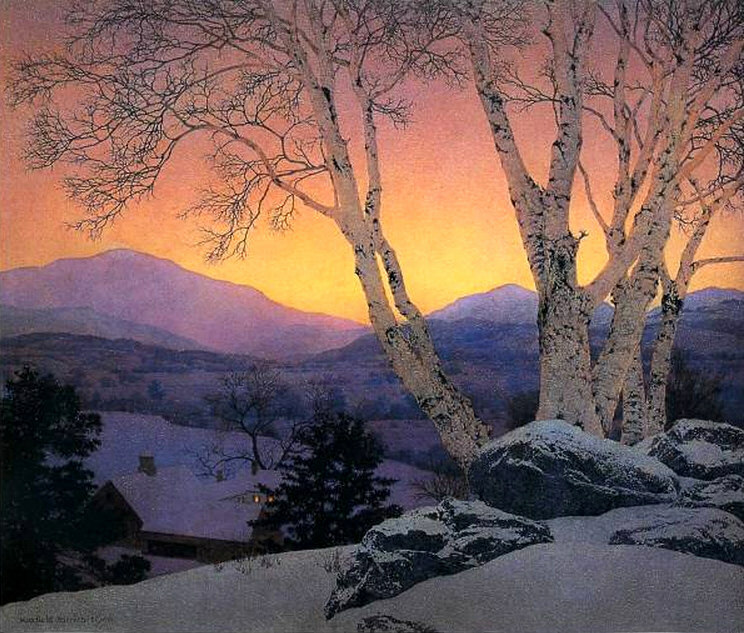 Birches in Winter by Mayfield Parrish, from Flickr Creative Commons. One of my goals as I get back to blogging is to celebrate beauty in as many forms as I can. Books, food, animals, writing, love. And paintings. This one is by Mayfield Parrish. He’s a favorite of mine because of the way he used light and especially the way he captured the light of the mountains, the strange, rosy look of it. This one is appropriate for a snowy winter day. That mountain could easily be Pikes Peak. It makes me feel calm. As if all is well and maybe I should go cook dinner. I’ve just learned this afternoon that his work is unique and he belongs to no particular school. He created his own process of glazing thin layers of oil alternating with varnish. Until just now, I didn’t know that some of his paintings hang in the Broadmoor, an old luxury hotel here in Colorado Springs. I should go have a look at them. Is there a painter who captures your part of the world especially well?